COLUMBUS, Ohio—“This is our election,” declared AFL-CIO President Richard Trumka here last week at the 31st Biennial Convention of the Ohio AFL-CIO. He told the more than 500 delegates and guests gathered in Columbus that Ohio is of central importance to labor and the nation this November. What’s at stake, Trumka said, is the fight for fair wages, quality affordable health care, safe working conditions, retirement security, the freedom to form unions, and “an economy that works for all of us,” not just for the CEOs and stockholders. Trumka and other convention speakers said this November’s election is labor’s chance to fight back against attacks coming from the Trump administration in Washington and the ultra-right, super-gerrymandered Ohio state legislature. One such attack is the right-wing Buckeye Institute’s campaign to persuade public workers, in the wake of the Janus decision, to opt out of their union membership. In addition, Ohio is surrounded by states with so-called “right to work” laws, and the Republican candidate for governor may be willing to sign such a law if passed by the Ohio legislature. All thoughts at the critical gathering of labor activists and leaders were on the November 6 vote, as speakers exhorted the delegates to join the AFL-CIO’s member-to-member effort by canvassing, phone banking, and discussing the election with friends, family, and coworkers. According to Ohio AFL-CIO President Tim Burga, the national AFL-CIO is investing more resources than ever before in an Ohio mid-term election, including greater efforts to get out the African-American vote in the Cleveland area. 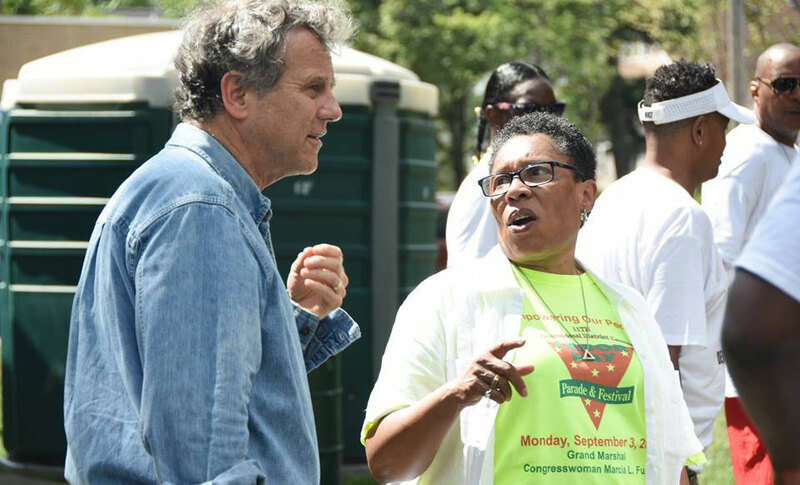 One of the electoral battlefields, one that polls show is in labor’s favor, is the re-election of Democratic Sen. Sherrod Brown, whom Trumka describes as “not just an ally, but a champion” of the union movement. In his address to the convention, Brown enumerated the accomplishments of labor, in U.S history and here in Ohio, especially the successful fight against Ohio Senate Bill 5, which would have denied labor rights to public workers and was soundly defeated in a referendum in 2011. An equally important contest emphasized at the convention is the race for governor. Richard Cordray, former head of the Consumer Financial Protection Bureau, is running in a close race against Republican Attorney General Mike DeWine. Many who addressed the convention stressed the importance that electing Cordray has for labor and for all working people. Joe Rugola, head of the Ohio AFL-CIO’s Political Committee, said that when Cordray wins Ohio, it will be “a new day for organized labor, a different day.” Cordray addressed the convention with the observation that under the GOP, we have a “Help Yourself, Serve Yourself” government in Ohio. He was referring to the poor stewardship of the state under the Republicans. A prime example is the scandal swirling around the Electronic Classroom of Tomorrow, which stole almost $200 million from Ohio taxpayers by falsifying records and faking student enrollment. ECOT’s owner, Bill Lager, a big donor to Republican candidates and causes, enjoys a $4.2 million estate in Key West, Florida while Ohio public schools are strapped for funds. Cordray has promised to oppose for-profit charter schools in Ohio. He has also called out DeWine on health care. In his first few days as Attorney General, DeWine joined a partisan lawsuit that would allow insurers to deny benefits to persons with pre-existing conditions, endangering the health care access of hundreds of thousands of Ohioans. Other labor-endorsed statewide candidates also addressed the convention. Secretary of State candidate Kathleen Clyde, a Democrat, decried the Republican practice of purging voter rolls and current Republican Secretary of State Jon Husted’s defense of that practice all the way up to the Supreme Court. She said the good news is that although the Supreme Court ruled that the practice was legal, it didn’t endorse the policy, and Clyde said she would stop the practice on Day One of her term as Secretary of State. The conference reelected Tim Burga as president and Petee Talley as secretary-treasurer of the Ohio AFL-CIO. Additionally, more than a dozen resolutions put forward by Central Labor Councils from across the state, the Ohio Coalition of Labor Union Women, and various union locals and international organizations, were approved by the conference. They included Medicare for All, paid family leave, support for the Parkland, Florida students’ call for common sense gun laws, and infrastructure investment. When he rose to speak in favor of the resolution supporting humane immigration policies, Farm Labor Organizing Committee President Baldemar Velasquez said the immigration debate in the U.S. today is not about protecting jobs, but about the greed and avarice of corporations. He said in this climate of the Trump administration, even his own citizenship was being called into question because the certificate of his birth in South Texas was signed by a midwife. The legality of these types of birth certificates is now being challenged by the Trump administration. Speakers stressed the union movement as the primary source of empowerment and agent of change for all Americans. Petee Talley’s theme, for example, was “What’s in your wallet? A union card. That card represents the power of workers,” she told the convention. Likewise, Richard Trumka stressed solidarity and unity as a winning strategy in recent victories like the defeat of “right to work” in Missouri in August. The November elections promise to be a test of that strength, in Ohio and beyond. 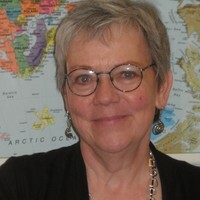 Anita Waters is Professor Emerita sociology/anthropology at Denison University, Granville, Ohio. She is a Board member at SomaliCAN, an organization providing hope and help for new Americans of the Somali community and other immigrant groups in Ohio.